This week at blog HQ I had an email from Danny Harrison. He is trying to find out where his dad’s truck XDH 849S ended up or what happened to it after its life at BJ Adams. 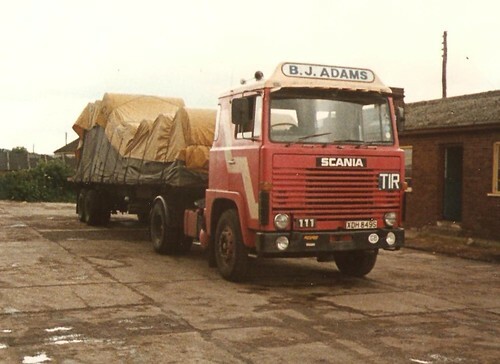 The truck was a Scania 111, sleeper cab, 4×2 tractor unit. Danny say’s his dad, George Harrison (no not that one) drove XDH 849S for about 5 years in the early 1980’s, but the last time they saw the truck was in Maidstone, Kent some time in the 1990’s. Hopefully Danny is going to email me some more of these classic old photo’s from his early years bunking off, sorry when he was off school. Who’s is the Seddon Atkinson Borderer?? 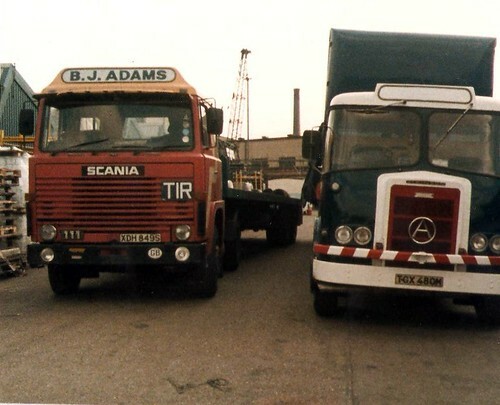 This entry was posted in Drivers Photos, Golden Oldies, Scania by truckbloguk. Bookmark the permalink. I wonder if it’s still alive ! and it was owned at the time by STAN PRINCE & SON of Northwich,cheshire. We spent 3-5 nights out a week at the Northerly parts of Scotland. I too, used to spend all my free time with my old fella in the various 111’a he drove for Manchester Haulage and Warehousing in the 70’s and early 80’a.d. I remember those times as if it were yesterday and would l i’ve a trip back just one more time, PNA451R and DNA304T, I made a1/24 scale model of the exact truck with spread axle trailer. I’ll put a photo on if I can find one…happy days indeed!